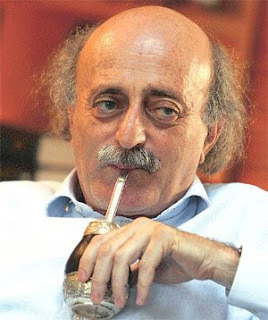 "friday-lunch-club": Jumblatt: "It APPEARS that the 'landline telecom network' pertains to the security of the Resistance..."
Jumblatt: "It APPEARS that the 'landline telecom network' pertains to the security of the Resistance..."
No kidding? Couldn't you have like 'double checked' before you plunged the country in strife, and given the Opposition this swift victory? Someone should make WJ accountable for all the lies, misery, and death his statements have caused to Lebanese over the last 32 years! When will his 'constituency' stand up and tell him enough is enough and you should go?